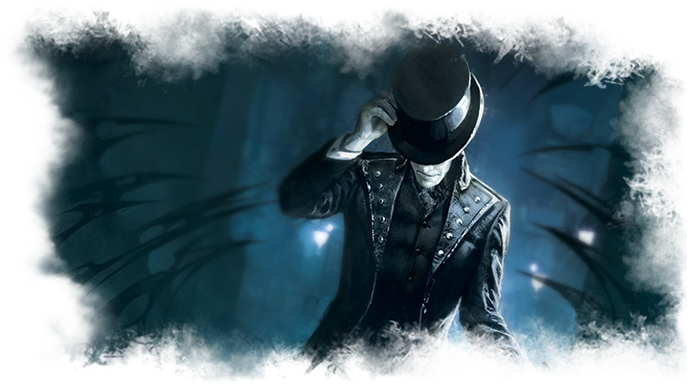 In A Phantom of Truth, you and your fellow investigators make your way across the Atlantic. Tormented every night by vivid dreams of an alien world—with black stars, twin suns, shattered moons, and twisted spires—you decide not to grapple with your Doubts and Convictions in Arkham, but to pursue whatever truth might lie behind the play. This is why you head to Paris; you hope to gain some answers from the play's director, Nigel Engram. 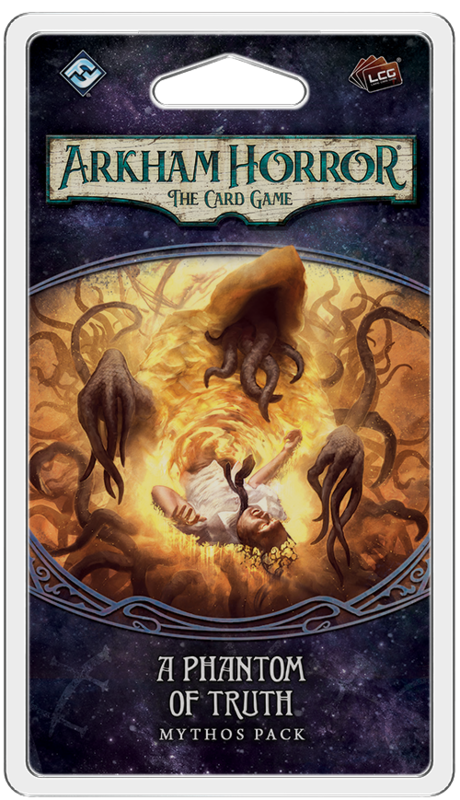 As we mentioned in our announcement of The Path to Carcosa, your investigations into The King in Yellow will eventually lead you into the sort of madness and confusion that force you to wonder what's reality and what's delusion. You may even find yourself wondering if the definitions of madness and sanity are as clear as you previously thought. 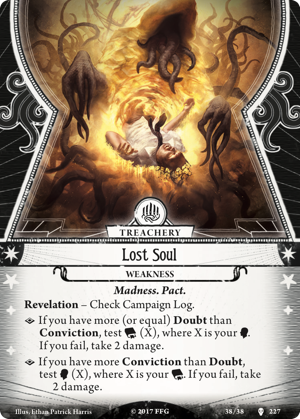 With that in mind, The Path to Carcosa campaign makes use of the new mechanics for Doubt and Conviction that we previewed in "A Mind Is a Terrible Thing to Lose," our look at the new scenarios from The Path to Carcosa. But what does your Doubt or Conviction do for you? Apart from check marks on your campaign log (pdf, 1.8 MB), what are they? These questions—and their answers—begin to emerge more fully throughout A Phantom of Truth. The first thing you'll learn is that it's still not clear whether it's better to operate like a skeptic rooted in Doubt or to trust your instincts and move forward with Conviction. Nor is it certain that your Doubt is always the sign of a curious mind; there may be times your Doubt is strictly a form of uncertainty rooted in madness—your inability to distinguish the real from the unreal, or the truth of things from their illusions. It's almost as if there's some terrible, malevolent force at work—guiding you, beckoning you, pulling you forward. And it's possible that your search for Nigel Engram may take a backseat to your desperate scramble to hold onto whatever shreds of sanity remain to you. And, here, is your Doubt your salvation? Or are you better off following your Conviction? In A Phantom of Truth, these questions matter immensely, and you'll need to find the right answers, lest you end up a Lost Soul (A Phantom of Truth, 227) in a very foreign land. 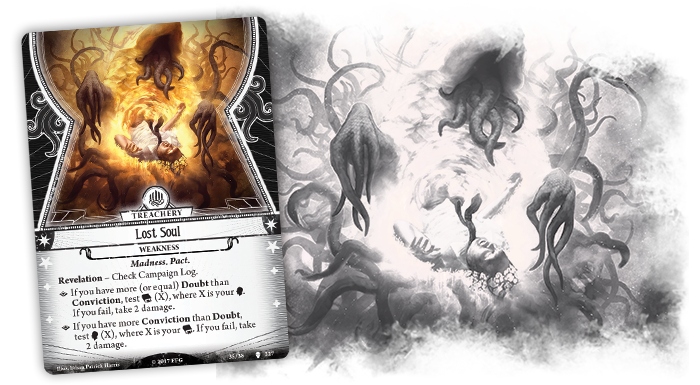 In addition to its scenario, A Phantom of Truth supplies you with twenty-two player cards (two copies each of eleven different player cards) designed to help you stay grounded and make progress in your campaign. 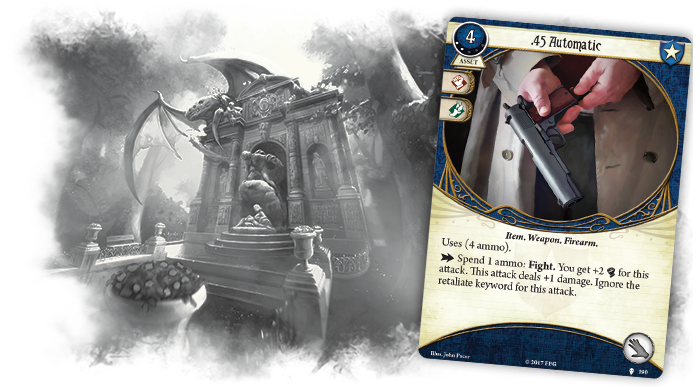 Among these, you'll find a handful of higher-level cards that recall the familiar, including a couple of fan favorites from the Core Set. One of these is the .45 Automatic (A Phantom of Truth, 190)—a wonderful Weapon to have in hand when you're beset on all sides by fear and foes. 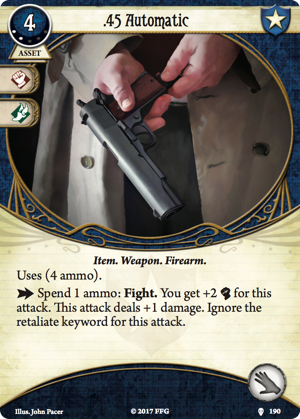 While this powerful handgun has been a Guardian staple since the game's debut, the two experience points you'll pay for the upgraded version in A Phantom of Truth are well rewarded by an extra Combat icon, the ability to ignore the retaliate keyword, and by an invaluable one-point boost to your Combat with every shot you fire. 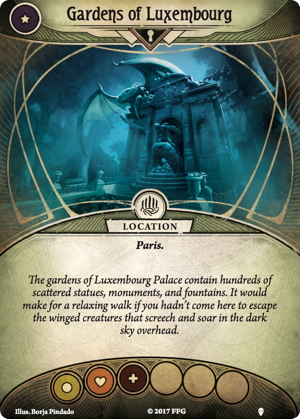 All of which may be handy should you find yourself stalked by strange, winged Monsters in the Gardens of Luxembourg . 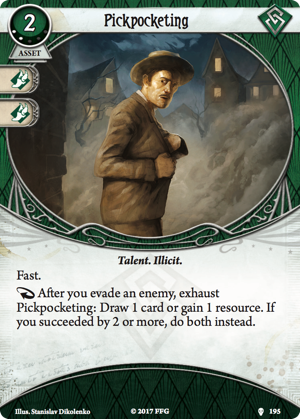 Similarly, fans of the Rogue class will find their Pickpocketing (A Phantom of Truth, 195) more powerful and profitable than ever. Like the .45 Automatic, Pickpocketing reappears as a Level 2 card that gains several advantages over its Level 0 counterpart. For your experience points, you are rewarded with the Fast keyword, which immediately gives you an action for your troubles. Next, you gain an extra Agility icon. While this Agility icon won't likely benefit you much the first time you draw your Pickpocketing—since you'll most likely want to put the Talent into play—the extra icon on your second copy of Pickpocketing could easily prove the difference between the success or failure of a critical evade attempt. That extra icon might even prove the difference between a standard success or a success by two or more that allows you to trigger the full benefits of your upgraded Pickpocketing. Instead of merely granting you an extra card draw when you evade an enemy, Pickpocketing now allows you to choose between a card draw or a resource—or, if you succeed by two or more, allows you to gain both a card draw and a resource. 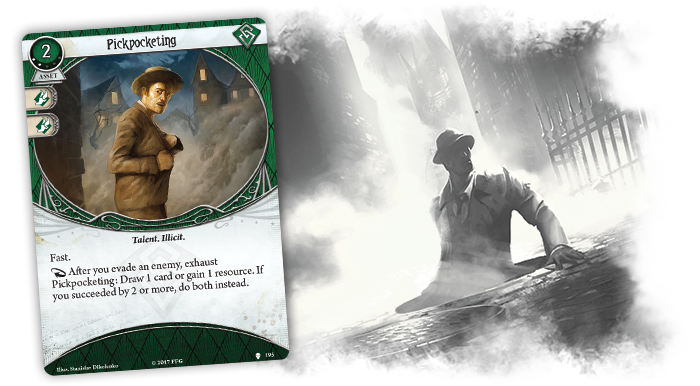 Together, these newly upgraded cards represent just one of the many different ways you might spend the experience you gain during The Path to Carcosa campaign, but it's one that might appeal to those investigators who are either already meeting with great success—as well as those who have been severely terrified and traumatized by all they have seen. In this latter case, sticking with the familiar may provide you the opportunity you need to increase your chances of success, without the unnecessary complications associated with the development of all-new tactics. Is this, at last, the path that will lead you to the truths behind The King in Yellow? Your trip to Paris is fated to be eventful, but will you find the man for whom you're looking? Or will someone—or something—find you instead?